The sight of Victoria Falls in full flow is one of the world’s greatest natural spectacles. A foaming mile of water crashes into a deep gorge to release a tower of spray – Mosi-oa-Tunya in the local language: the Smoke that Thunders. It’s an iconic destination, easy to get to and rich in experience. 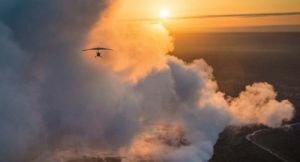 Many Botswana and Namibia safaris end with a grand finale at Victoria Falls Zimbabwe; after all, Victoria Falls lies just 70 kilometres from Botswana’s world-famous Chobe River. And the most reliable all-year round views are from the Zimbabwe side of Victoria Falls. 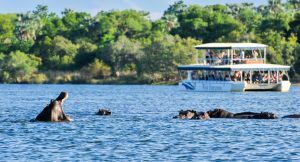 Surrounded by game reserves, Victoria Falls lies at the heart of the southern Africa safari experience; hippos snort from the river upstream from the falls, elephants and buffalo gather at local waterholes and the birdlife is prolific. 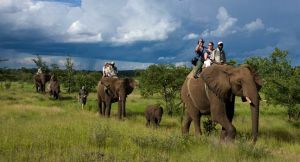 It is also Africa’s adventure capital, home to the world’s best one-day white-water rafting as well as bungee jumping and elephant-back safaris. You can go on game drives, explore the river by canoe, walk with friendly lion cubs and end the day with a sunset boat cruise. 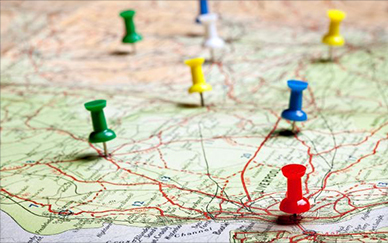 There are local communities to visit and get involved with too. 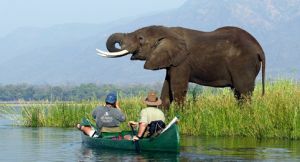 The Zambezi River is the border between Zimbabwe and Zambia; Victoria Falls is thus ‘shared’ between the two countries. Adventure and safari activities are generally available on both sides of the river and it’s easy to get from one country to the other if you need to. A bridge connects the two sides and if you buy the excellent-value Univisa, you can cross the border as often as you like. Victoria Falls Zimbabwe is more developed than the Zambian side. The bustling town of Victoria Falls sits near the waterfall and several of its hotels are within strolling distance of the main viewing site. A town accessed by road or air, this is where you’ll find hotel accommodation as well as safari lodges located out of town on private reserves. The views of Victoria Falls from the Zimbabwe side are more varied and extensive, and you’ll see water going over the falls throughout the year. You’ll also spot antelope, monkeys and birds in the local rainforest as you make your way between viewing points. Whether you go on foot or take to the air in a plane or micro light, make sure you see Victoria Falls close up. Ask us about getting the best views for the time of year. The best way to end the day: a Zambezi river cruise delivers the right balance of wildlife, scenery & comfort, topped off with a sunset & your favourite chilled drink. 3. – 1 … 2 … 3 … Bungee! 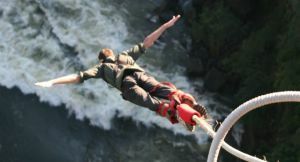 You can bungee jump all over the world but this 100 metre drop is one of the biggest & has nothing less than Victoria Falls as its backdrop. Visit between August & December for rafting at its best. 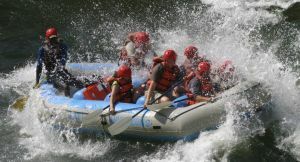 With nearly half its rapids classed as top-of-the-range Grade 5, the Zambezi River is an unforgettable roller coaster ride. Our favourite way of enjoying the spectacular drama of Victoria Falls. 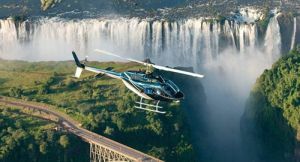 On a helicopter safari you’ll be on the lookout for hippos & elephants as you fly above the Zambezi. Not for the faint-hearted! A boat trip to Livingstone Island & then a careful walk to the very edge of the falls & your destination: Devil’s Pool, overlooking the abyss. Travel to a sanctuary for the ultimate in elephant encounters: you’ll feed orphaned babies, pose for jumbo-sized selfies & then go game viewing atop of a friendly adult. 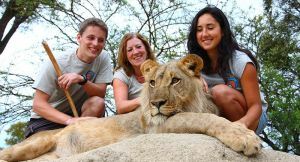 Big cat fans can’t miss this opportunity to walk in the African bush with habituated lion cubs; their playful, curious nature will leave you with lifelong memories.